In a deal that puts a new spin on mobile music promotion in the Japanese market, DoCoMo announced a partnership with Tower Records Japan opting to buy 42 percent of the music retailer for 12.8 billion yen ($109 million). Scheduled to go through by late November, the deal will make DoCoMo Tower’s single largest shareholder. The music retailer operates 78 Tower Records stores and 31 Wave music outlets. Tower’s motto in Japan is “The Best Place to Find Music” but will DoCoMo find it the best place to create musical revenue? Taking the stage at a Tokyo press conference November 8th, Takeshi Natsuno, senior vice president and managing director of NTT DoCoMo’s multimedia services department, and Hiroyuki Fushitani, president and chief executive officer of Tower Records Japan, gave the press few details on their upcoming fusion of telecom and music marketing. Not surprisingly, projects center around DoCoMo’s Osaifu Ketai (mobile wallet) platform for 3G handsets. Users will be able to wave their mobile phones over displays at Tower stores to download coupons or purchase CDs, picking them up at the sales counter on their way out. From this winter phones equipped with DoCoMo’s ToruCa (toru, capture; Ca, card) information-capture service will include Tower reader/writer units to download news on favorite artists, special offers from music labels, ticket reservations, and other music-related information. Tower’s popular redeemable purchase point system will also migrate onto mobile phones. Japan’s Mobile Content Forum recently reported that Japanese users who buy ring tone melodies budget around 20 percent of total music purchased for downloaded music onto their phones. Many of those are undoubtedly from rival KDDI’s full music download service, Chaku Uta Full. Currently with over 20 million downloads and counting. With CD sales in a gradual multi-year slump, it seems an interesting time to invest in a real world music retailer. Especially since consumer attention is finally shifting towards customizable digital music with a corresponding upsurge in portable players. In October Tower Records aligned itself with Napster LLC, taking a 31.5 percent stake in the venture at the cost of 309 million yen. Though the NTT DoCOMo alliance does not impact this deal, DoCoMo is without a doubt counting on some aggressive joint marketing for the expanding music download market. NTT’s Natsuno hinted at future handset developments with greater music capabilities and that is hardly necessary just to purchase CDs at a Tower kiosk. Napster music services should roll out in early 2006. Mobile commerce over cell phones jumped 25 percent last fiscal year to around 971 billion yen ($8.8 billion) according to a survey on e-business just released by Japan’s Ministry of Economy, Trade and Industry. Covering all of fiscal 2004 (which in Japan ended March, ’05), the survey showed wireless purchases of books and music had grown by 85 percent from virtually nothing the previous year to 330 million yen ($3 million). Trendy MTV Japan is another strong contender with Tower for mobile musical moments. MTV has a presence via the PC Internet and over mobile phones in Japan but at press time, still did not market CDs directly over the mobile Web. At the end of October, Yahoo Japan began distributing of MTV Japan digital content free online. Last summer the broadcaster launched Flux, a Japan-exclusive mobile and online entertainment channel. The service was initially available only on KDDI’s au EZWeb network but is now on i-Mode as well. For 315 yen a month, mobile subscribers get original Japanese video and animation productions and programming from the global MTV Networks library. Flux targets 13-34 year-olds. Right now DoCoMo is the only carrier without a proprietary Chaku Uta Full (full music) service. In late October the carrier did link with Giga Networks for a full download style service but without the ease of KDDI’s. Users must download and save the songs, then use a Java appli to listen to them. Plus the site has only a few hundred songs compared to the 60,000 available on over 40 KDDI Chaku Uta Full sites. Instead of turning up the volume on music downloads over its network, the company has focused resources through this deal on Osaifu Keitai services and content — at least for now. What they are counting on accruing are vast incremental payments as Japanese consumers wand their yen. DoCoMo has already cemented deals for their credit card connection with the Sumitomo Mitsui Financial Group (they are part of Visa Japan and Visa International) and Sumitomo Mitsui Banking Corporation (SMBC) which has agreed to develop ATMs compatible with the DoCoMo handsets. 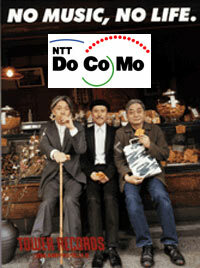 DoCoMo seems content to buy itself into the music retailing industry bypassing growing the business from the ground up. Shades of investments past.